so i'm obviously behind on posting pictures because this one was this summer. 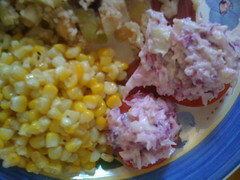 i had fresh corn and purple coleslaw on tomatoes and it was food they eat on the farm. the couscous chickpea curry, not so much.